The release of Subelevel Zero brings with it a nostalgia for the rogue-like, 6DOF genres many of us know and love. 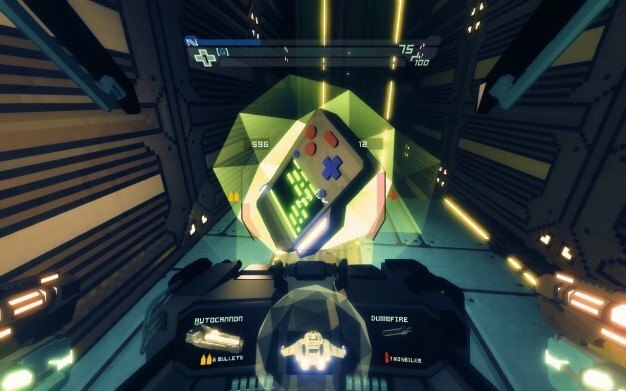 For those people who played Descent, Sublevel Zero will bring back a flood of happy memories. Set in a future where humanity is scattered throughout the universe and reality is falling apart, you are a lone gunship pilot delving into an abandoned space station. Your mission is to loot and craft ancient technology as you explore each level of the station, surviving against robotic defense systems and ultimately trying to find your way home. 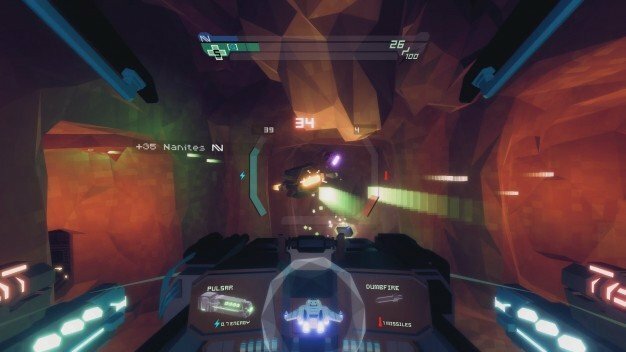 The gameplay in Sublevel Zero is smooth and relatively easy to adapt to. 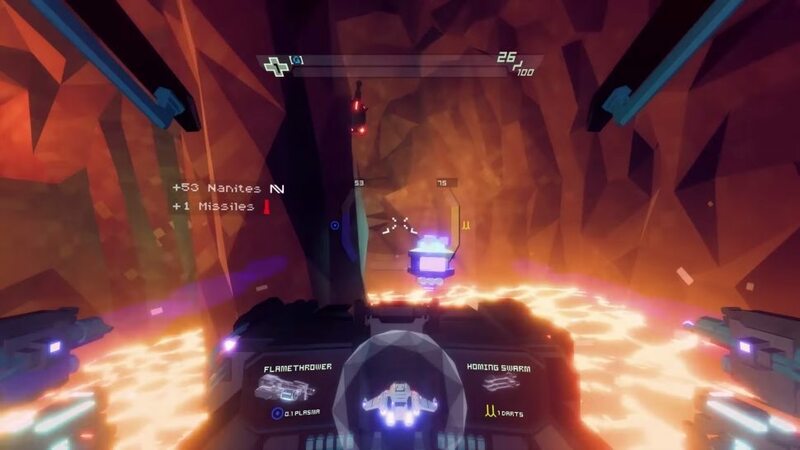 The game is first person, and you view the environment from inside the cockpit of your gunship, surrounded by a sleek and minimal HUD. The game runs with 6DOF (six degrees of freedom), which gives an increase of movement potential which can take some getting used to. You should be zooming around comfortably pretty soon though, as you become used to the well oiled mechanics of the game. For much of the game, combat is pretty simple. The enemies you encounter early on will either hang back and try to snipe you, or come charging with guns blazing. Either way, they don’t present much challenge. However, as you explore further, you will soon be desperately dodging, rolling and hiding while simultaneously panicking to catch the frustratingly nimble enemy in your sights. Permadeath adds a whole other meaning to the word “tense,” especially when your health starts to get low. If you die, you start again from the beginning, and the roguelike element to the game means that each level you have to retry is gong to be slightly different. However, the changes are small, and quite quickly it can feel repetitive and frustrating. There is a satisfying if rather slow progression of weaponry and inventory throughout Sublevel Zero. There are various types of weapons and armor to collect, each with an acceptable range of variety which mean you can, to some extent, cultivate your own particular style. Collecting enough nanites and parts allows crafting. Personally, I always find a crafting function to be essential in exploration/RPG type games, and it is a welcome addition to Sublevel Zero. The aesthetics of the game are beautiful, and almost make up for the frustration of having to go through similar ones again and again after permadeath; although not quite. 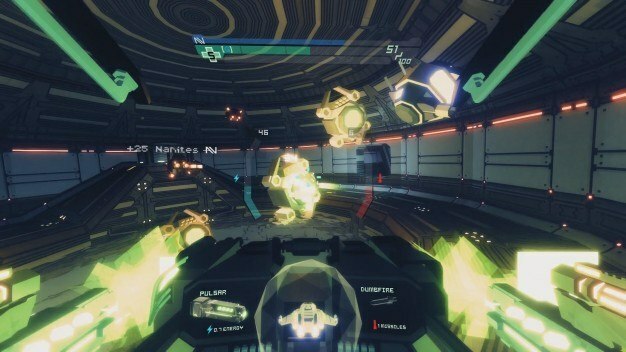 The environments are bright and colorful with a blocky feel to them, a comfortable reminder of the older, arcade-style games that inspired Sublevel Zero. The lively music greatly enhances the 90’s arcade feel of the game. There are six levels to the game, each one riddled with mind bending twisting corridors and tunnels and cavernous rooms, filled with various defensive systems you must overcome. To progress through the game you must destroy the reactor at the end of each level, releasing a flux drive which creates a portal to the next stage. Simple enough. However, the levels are often annoyingly confusing, requiring you to constantly re-orientate yourself with the 3D map, which frankly is sometimes less than helpful. Having to go through the same frustrating process of getting lost for what seems like hours in the same maze of dead ends and empty rooms over and over again each time you die is somewhat of a downside to the game. Somewhere on each level you should find a text log with the recordings of someone who worked at the space station. These add a little backstory to the otherwise nonexistent narrative and story line. The absence of any investment in the story detracts a little from the enjoyment of the game, making your progression through the game feel slightly pointless after a couple of hours of playing. At its core, Sublevel Zero has some fantastic aspects. The gameplay and controls are smooth as well as engaging, and add to the sleek dynamics of the game; the environment and aesthetics are beautiful and well made. However, after a while it isn’t really enough. It feels like there is something lacking, and that makes it difficult to come back to the game after you’ve died once or twice. Deep down, it is a good game, and well worth the money; but it does need some work. Tom Velterop has been an avid gamer for several years, and since even before that his passion has been creative writing.